The Black Caps Twitter account have just confirmed that the match has been called off and India has won the warm-up fixture against New Zealand by 45 runs on D/L method. The rain has got heavier and the umpires have decided to stop the play. The players are coming off the field. India are ahead on the D/L method. FIFTY! A fine innings from the Indian captain Virat Kohli. He has played some delightful shots but all around has built his knock on the ones and twos. India wanted their captain to get back amongst the runs and he has done exactly that. OUT! Neesham steams in and bowls is short, it is outside off and Dhawan drags his pull straight to Corey Anderson at mid-wicket. New Zealand finally break this frustrating partnership. OUT! New Zealand have been bundled out for 189! A collective bowling effort from all the bowlers, really. Coming back to the wicket, it was a length delivery, outside off, Boult gave himself room and looked to go over covers but Shami, at that position, reverse cupped the catch. OUT! Kohli goes to Bhuvneshwar Kumar for a wicket and the UP pacer has provided that for his captain. A length ball which Southee tries to drive but he was playing away from the body. He inside edges it onto his stumps. OUT! Milne was constantly being troubled by the short balls and that delivery itself ends his stay at the crease. Umesh hits the deck hard and keeps it around leg, Milne looks to pull it away but only manages to glove it to Dhoni. New Zealand lose their eighth wicket. OUT! You simply don't attempt a cut against Jadeja, more often than not you will end on the losing side. Jadeja darts one around off, Ronchi looks to cut, but the ball is too close to his body, he fails to connect and the ball goes onto crash into the stumps. OUT! Bhuvneshwar Kumar has the last laugh against the dangerous looking Corey Anderson. Bhuvi bowls a back of a length delivery, Anderson backs away and tries to pull it away only to connect thin air. He misses but the white object doesn't, off comes the leg stump. Time for drinks with that wicket. FIFTY! Ronchi looks to flick Bhuvi away but it takes the leading edge and runs away to the third man fence for a single. The Kiwi won't mind that. A patchy innings but he will take that. 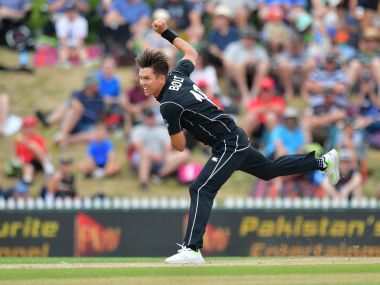 The Men in Blue will take on the Black Caps in a warm-up match at The Oval on Sunday. Ace southpaw Yuvraj Singh will miss the match due to a viral fever. So that is it from us today. Do join us for India's second warm up match which is on Tuesday and against Bangladesh. Till then, goodbye and take care. With India 61 runs shy of victory, players leave the field due to rain. Dhoni gets off the mark with a cut that races away for a boundary past point. FIFTY! A much needed knock for Kohli. 7 and 5 runs off 23rd and 24th over of the 2nd innings. The weather has got overcast and it has started swinging around. Resulting to which, Williamson goes back to Boult and he provides his captain with a wicket of Dinesh Karthik. Kohli is closing on his fifty. Will he declare his innings after getting to the milestone? We will have to wait and see. Meanwhile, the crowd has got very excited as Dhoni walked out to bat. They would want the former Indian captain to stay till the end in this chase. OUT! Karthik never looked settle in his short stay at the crease and he has perished. Boult bowls a back of a length delivery which gets big on Karthik as he tries to pull it. Santner accepts an easy catch at mid-wicket. A superb pull from Dhawan off Neesham! He was in so much control of that shot that the fine leg had no chance to even near the ball. De Grandhomme bowls a decent 2nd over, only 4 runs off it. Neesham comes into the attack in the 15th over and allows only 3 runs off his first over Colin de Grandhomme too introduced into the attack. On the fifth ball, he bowls a length ball outside off, Kohli guides it to the third man with a controlled outside edge. 9 runs off the 16th over. Milne to bowl the 13th over. The Kiwi hits the deck hard and Dhawan dispatches it just as fast to the third man fence. Meanwhile, Kohli is being Kohli. He drives Milne down the ground and at first it seemed like he will get a boundary but only gets three. Southee keeps things tight at the other end, 2 off it. India keeping it easy-peasy not taking any risks. They score 2 runs off 11th over. Southee continues and bowls it short to Kohli and the Indian captain pulls it fine for a boundary. Good running between both these Delhi batsmen means they will end the 12th over with 8 runs. Milne bowling to his IPL captain Virat Kohli. Kohli attempts a straight drive but gets an inside edge which rolls away to square leg. He isn't happy with that shot. He ends the over with a sumptuous straight drive, this time getting it right. The ball races away for a boundary. Southee will bowl the 9th over. Wow! Another beautiful straight drive from Kohli and he gets the desired result. FOUR! This time its short and outside off, Kohli cuts it hard and Neesham has a chance to catch but he makes a mess out of it. Adam Milne bowls the 7th over and concedes just two runs. India in not a lot of hurry, doing it easily now. Kohli gets a brace off the fourth ball of the over by turning a short-pitched delivery to square leg. Boult is even more economical in the next over. Concedes just a run. India will be wary of getting bogged down and putting pressure on themselves. Dhawan gets hit on the helmet off a well-directed short ball. Dhawan and Kohli pick up the thread after the lunch break. Boult bowls the sixth over. The first ball shapes away. Dhawan defends. The second ball is an outswinger too and beats the outside edge of Dhawan's bat. An appeal for LBW against Dhawan on the next ball, but the impact looks to have been outside off. Not out. The rest of the over is played out without any fuss by Dhawan and Kohli. Two runs from that over. Time for lunch break at the Oval. India are in a good position and require 160 runs off 45 overs with nine wickets in hand. OUT! Southee bangs it short and Rahane attempts a pull which goes straight to Trent Boult at fine leg. The Mumbai batsman is dejected and rightly so, he had an opportunity to play through the chase given the total. Dhawan has started using his feet to counter the swing and is looking more comfortable now. A full toss from Southee helped his confidence which was driven away through covers for a boundary. Dhawan also cuts Boult through point for a boundary. Positive approach from both the oepeners. Southee troubled Rahane with the outswingers but the Mumbai batsman negotiated those. Shikhar Dhawan's struggle against left arm fast bowlers continued. He cut one straight to Neil Broom at point but the fielder put it down. He edged the fifth ball of the second over which raced away to the third man boundary for a four. The New Zealand fielders are sauntering out in the middle. They failed to play out their 50 overs so there is time for the innings break. Shikhar Dhawan and Ajinkya Rahane to open the innings. Tim Southee to start the proceedings for the Kiwis. Jimmy Neesham is still hanging around and he should try to take New Zealand's score over 200. This pitch looks good for 260-270 but the Kiwis have put up lackluster performance. Kohli, meanwhile, is rotating his bowlers and allowing everyone to have a go. Umesh Yadav, like Ravichandran Ashwin, is trying out new things. He bowled a leg break, something we saw him do in the 2017 IPL. He has consistently bowled yorkers too. Mohammed Shami comes back into the attack and is on a hat-trick. But Milne drove his first delivery to mid off for a single. Neesham failed to score a single run off the remaining five balls. Neesham is taking on Ashwin here. He is coming down the ground, going back, basically trying everything to disturb his rhythm. Anderson uses his feet and clips in front of square on the leg side. The fine leg fielder hares across to stop it but fails. Ashwin is not happy with that effort but to be honest, even a fielder like Jadeja would have found it difficult to save that boundary. Umesh Yadav replaces Ravindra Jadeja and gives two runs off his first over. Ashwin to continue from the other end, he, I feel, will bowl 10 overs given the lack of match practice he has got in the last couple of months. OUT! I don't understand what is the hurry, asks Sanjay Manjrekar on air quite correctly. A nicely tossed up delivery by Ashwin after he sees Santner charge down the ground. The southpaw still went for the shot and holed out to Jadeja at long on. Whatever issues the New Zealand batsmen were having against the Indian bowlers have been doubled since the spinners have come into the attack. Lack of communication between Santner and Neesham almost results in a run out. But the fielder took time to run in from mid-wicket to short mid-wicket and that saved Santner. OUT! New Zealand are falling apart. Colin de Grandhomme comes down the track to drive Jadeja but the bowler bowls it quick. The batsman fails to get bat to ball. Dhoni collects the ball and swiftly whips the bails off. Outstanding keeping! Days before the Indian cricket team left for England, Ashwin had revealed that he has some new tricks planned for the Champions Trophy. And now we know at least one of those tricks, a leg break. He has bowled that a few times in Test cricket though. However, the batsman, Colin de Grandhomme read it and negotiated it. Spin from both ends and we know how that ends. Super fast overs. Anyways, Jadeja was being himself in his first over, bowled tight lines and conceded only one run. While Ashwin, after a two month break, came back to bowl in the 20th over. A decent over first up, only 3 off it. Despite the wickets, Luke Ronchi has decided to not change his approach. Ronchi goes back and tonks Hardik over mid off for a six. But Hardik responds well and allows only three runs off the remaining five deliveries. The Indian pacers are all over New Zealand batsmen. Except Luke Ronchi, none of them seemed to have any answer to the questions that were put forward by the pacers. The onus is now on Ronchi to bring some stability to the New Zealand innings. Corey Anderson after being cautious early on has decided to take the attack to the opposition. Virat Kohli brought Hardik Pandya back into the attack albeit unsuccessfully as the Bardoa pacer went for 9 in his comeback over. Luke Ronchi clearly struggling against Jasprit Bumrah. While Corey Anderson is taking his time to settle. Though Shami has been slightly expensive, he has provided the breakthroughs for India. Not to mention Bumrah's top overs which put the New Zealand batsmen in pressure. OUT! Shami's first three deliveries of his 5th over went for 4, 4 and a 6. But he has come back strongly. First got rid of Williamson and now induced a nick off Broom to Dhoni. The Kiwi goes for a golden duck. OUT! Williamson goes on the back foot and looks to punch Shami through covers but ends up edging it to Rahane at first slip, who completes the regulation catch. The captain takes the long walk back to the pavilion for 8. India has regained some control after Jasprit Bumrah got introduced into the attack. Runs not coming that easily. Makes a difference when the captain has a thinking bowler. He has beaten Ronchi both on the top edge and the outside edge.Dropped! The dot balls forced Ronchi to take a risk and he did. However, Ashwin failed to grab the opportunity at mid on. India have bowled many length deliveries early on, a few were put away behind the fence and one went straight to Bhuvneshwar Kumar mid off. Hardik Pandya took the second new ball which is an indication of the things to come in the tournament. Preview: Defending champions India will take on a resurgent New Zealand in their first warm-up match at the Oval on Sunday. India is also scheduled to play a warm-up match against Bangladesh on 30 May at the same venue. However, even before the Men in Blue could begin their campaign to defend the Champions Trophy, ace batsman Yuvraj Singh is all set to miss the first warm-up match due to viral fever. Yuvraj, laid low due to fever, had also missed the first two warm-up sessions. However, the BCCI confirmed that the senior pro is recuperating well as per the information of the medical team. "He is advised rest and will miss India's first warm-up match against New Zealand at The Oval on 28 May, 2017. The medical team will continue to monitor Yuvraj Singh's progress and hope for a speedy recovery," it further stated. Meanwhile, Captain Virat Kohli had said that India will go out "to enjoy" their cricket as they aim to defend their Champions Trophy crown against the backdrop of a row over money with the international board. The Board of Control for Cricket in India (BCCI) backed out of a threat to boycott the 50-over tournament in a revenue-sharing dispute with the International Cricket Council (ICC). But they had only named a squad two weeks after the original deadline for the tournament which starts on 1 June. Kohli said that the team were determined to keep their hunger for success. "The hunger to win and ruthlessness is what we speak about all the time," Kohli told reporters before India left for England. "The first challenge is to not think about that you are defending the title. When we went out there the last time we just wanted to enjoy," said Kohli. "We were a young unit. We ended up winning the tournament and creating a team which has done so well so far." The BCCI are angry at the new ICC revenue model agreed last month that reduced the powers of cricket's "Big Three" -- Australia, England and India. The BCCI believes it will lose $277 million in revenue over the next eight years. Former India captain Kapil Dev had said he hoped the row would not affect performances on the field. "I hope all this talk doesn't impact the players. But today, media putting so much focus on everything it must be having some effect on them when they read and see the news," Kapil, the 1983 World Cup winning captain, said. "As a sportsman I just want to be bothered about cricket on the field. "Whatever happens otherwise, let the administrators take care of that," the legendary all-rounder said. The BCCI are seeking a better deal before the ICC ratifies the new structure at its annual conference next month. "See, we are just trying to get the board its rightful share," a senior board official had told AFP on condition of anonymity. "But trust me the revenue matter had nothing to do with the Champions Trophy. "We work for the best interest of the players and our wishes are with them to defend the title and play the brand of cricket that they have been playing." India, who beat England in the 2013 Champions Trophy final, are on a roll, winning 10 of the 13 Tests played against New Zealand, England, Bangladesh and Australia in a marathon home season. The side also won their three-match one-day series against England 2-1 and most of their players have just been involved in the high-octane Indian Premier League Twenty20 tournament. India are in Group B along with South Africa and Sri Lanka and start their campaign with a mouth-watering clash against fierce rivals Pakistan at Edgbaston, Birmingham, on 4 June.